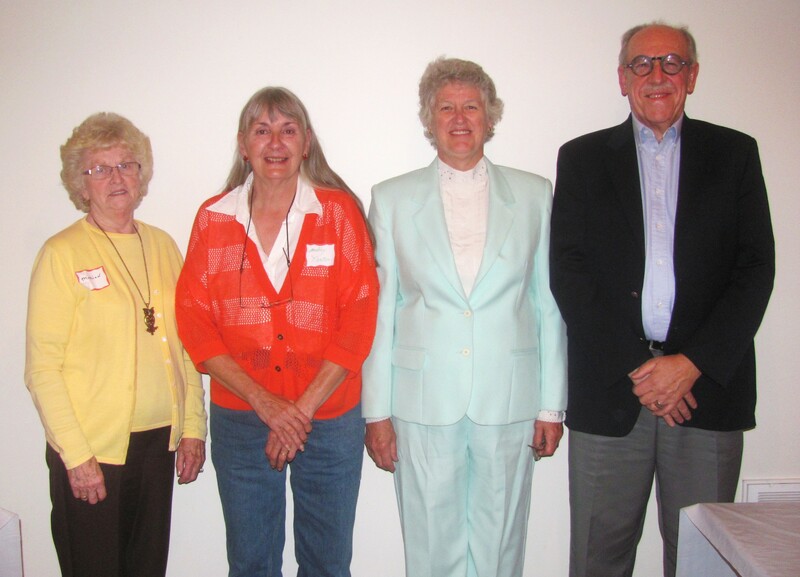 One order of business at the annual membership meeting of the Endless Mountains Heritage Region was to confirm a new slate of officers, including (from left) Treasurer Marion Sweet, Secretary Melanie Norton, President Sandy Wilmot, and Vice President Tom Henson. The Endless Mountains Heritage Region (EMHR) board met at American Legion Post 510 in Black Walnut on Oct. 16 for its annual membership meeting. New officers were confirmed, as were several new members to the board. 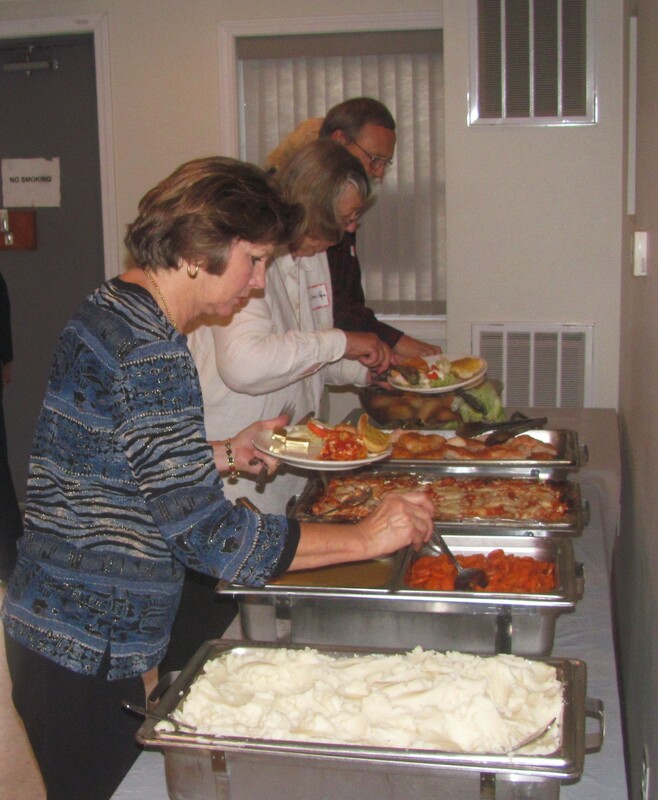 After a regular meeting of the board, additional guests arrived to enjoy a social hour and meal prepared by post members and auxiliary. Key speakers at the event included Eve Holberg of Peter J. Smith & Company, who outlined the final draft for EMHR’s revised Management Action Plan (MAP); EMHR Greenway Coordinator David Buck, who updated those in attendance on river-related initiatives; and Eaton Township Supervisor Randy Ehrenzeller on recent progress along the Seneca Trail in Wyoming County. Frank Oliver of Tunkhannock conducted his last meeting as outgoing president and welcomed Sandy Wilmot of Clifford Township to the post. Additional new officers recognized included Tom Henson, Vice President; Melanie Norton, secretary; and Marion Sweet, treasurer. New members brought onto the board include John Krakoski in Sullivan County and Erica Rogler in Wyoming County. 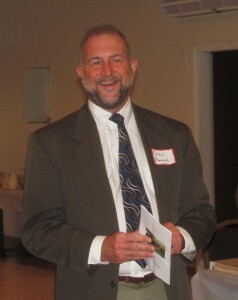 The board members were then joined by approximately 30 additional guests who enjoyed a program guided by EMHR Executive Director Phil Swank, who provided a synopsis of projects and programs in the four-county Endless Mountains region that were promoted and/or financially supported by EMHR in the past year. 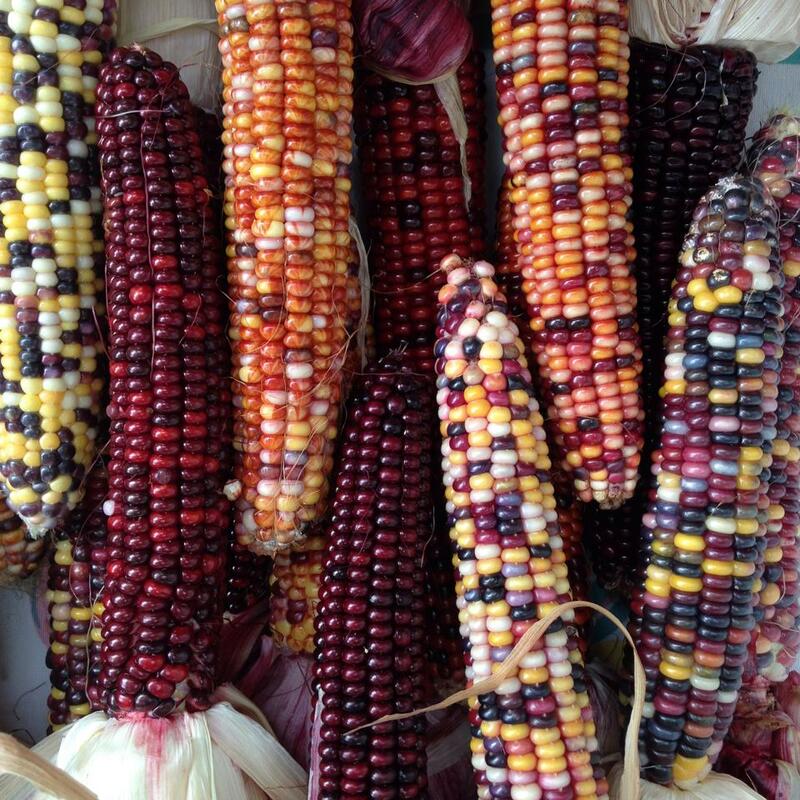 They include Laceyville’s Oldest House, the Clifford Township Museum, Eagles Mere Crystal Lake Casino and antique auto museum, Rekindle the Spirit at the Manley-Bohlayer Farm, the Howland Preserve at Vosburg Neck, the ghost town of Ricketts, Seneca Trail signage, and the Oct. 25 A Taste of the Endless Mountains event coordinated by Buy Fresh Buy Local, the Bradford County Conservation District, the Troy Historical Society, and FFA. She and partner, Peter Smith, logged many miles and spoke to many people in the area since January and developed a four-county map that features touring loops and “heritage nodes” geared to match the more reserved pace of today’s travelers. Among other observations and suggestions, the new MAP, which will be voted on by board members at their December meeting, promotes a general decentralization of EMHR resources and updating bylaws and other policies more frequently. Holberg also encouraged continued partnering with like-minded agencies and providing guidance for municipalities. “Everybody has a role in helping to preserve and enhance the Endless Mountains,” she said. Buck summed up a year that included the mapping of the Susquehanna River North Branch for recreationists, the formation of the 444 Club to inspire more paddlers to traverse the entire 444 miles of the Susquehanna River, coordinated cleanup efforts of shorelines and islands, and the involvement of school groups in a number of initiatives. “We need to teach our youths about the river and our elected officials about protecting our waterways,” Buck stated. 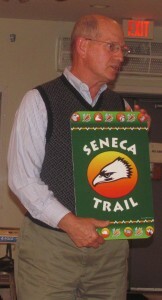 Ehrenzeller spoke of future phases in the completion of the Seneca Trail project. A preliminary brochure defines the six-mile pedestrian and biking trail though Eaton Township. The old Eatonville bridge over Bowman’s Creek will be replaced with a sturdier structure that should be enjoyed by hikers and anglers alike, he noted. Development of trailheads and parking areas will follow as the route is more permanently linked to another section of the greater Iroquois Trail in Tunkhannock. Ehrenzeller credited Native American artist Carson Waterman for working closely with Betsy Green of Tunkhannock to develop signage that incorporates a number of nature-related icons that represent Native American family names. “(Waterman) helped create a meaningful connection to what we are doing here,” Ehrenzeller related. To learn more about EMHR’s mission, resources and projects, interested readers may log on to www.endlessmountainsheritage.org. EMHR Executive Director Phil Swank guided the after dinner program of the organization’s annual membership meeting on Oct. 16. 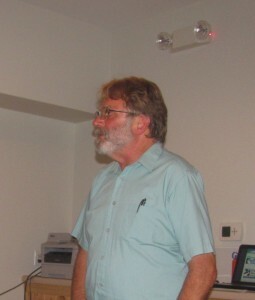 EMHR Greenways Director David Buck showed a series of slides that depicted EMHR’s support of river-based activities in 2014. Eaton Township Supervisor Randy Ehrenzeller exhibits one of the signs that will mark segments of the Seneca Trail that generally parallels Route 29 and Bowman’s Creek in Wyoming County. 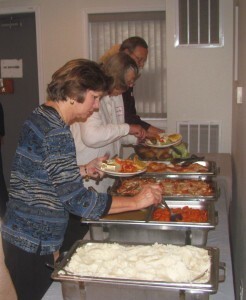 EMHR members and guests enjoyed a sumptuous home-cooked meal prepared by Post 510 auxiliary members.